One day, two guys were driving to a local grocery store to get some food. On the way to the store they ran into an intersection with a stoplight. The man driving went right through the red light. The passenger looked at the driver and screamed, "What the heck are you doing? You're going to get us killed!" Then the driver responded, "Don't worry, my mother allways drives like this." 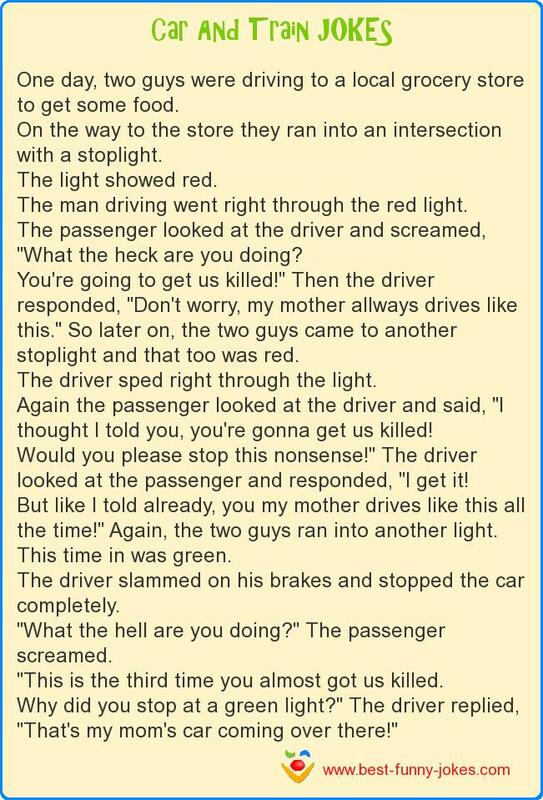 So later on, the two guys came to another stoplight and that too was red. The driver sped right through the light. Again the passenger looked at the driver and said, "I thought I told you, you're gonna get us killed! Would you please stop this nonsense!" The driver looked at the passenger and responded, "I get it! But like I told already, you my mother drives like this all the time!" Again, the two guys ran into another light. This time in was green. The driver slammed on his brakes and stopped the car completely. "What the hell are you doing?" The passenger screamed. "This is the third time you almost got us killed. Why did you stop at a green light?" The driver replied, "That's my mom's car coming over there!"